Nithya Menen is a well-acclaimed actress and singer, who is best known for her works in South Indian film industry. She is an idealist who originally aspired to become a journalist, but after studying journalism, she realised that today’s journalism isn’t the way it should be. Thus decided to become a filmmaker, so that she would be able to express her ides through films, and enrolled at FTII Pune to study filmmaking. During her entrance exam, she surprisingly met director Nandini Reddy, who convinced her to pursue acting and the rest is history. Nithya Menen was born on the 8th of April 1988, to a family of Malayali background in Bangalore, Karnataka, India. She is currently 31 years old. Nithya Menen completed her schooling in her hometown. She studied journalism at the Manipal Institute of Communication in Manipal. She, then, enrolled to the Film and Television Institute of Indian (FTII) in Pune, Maharashtra to study filming, but dropped out to pursue her career in acting. Nithya Menen prefers not to reveal anything about her personal life to the media. As a child artist, she made her onscreen debut in 1998 Indian – English language film, The Monkey Who Knew Too Much. Nithya’s first title character came with the 2005 Kannada film, Seven O’Clock as Anu. In 2008, she made her Malayalam debut with Akasha Gopuram for her role Hilda Varghese. In 2011, Nithya Menen played herself in the film, Ala Modalaindi, marking her Telugu debut. She received Nandi Award for Best Actress and two Filmfare nominations for Best Actress and Best Female Playback Singer, respectively for her role in the film. The same year, she made Tamil debut with Nootrenbadhu alongside Siddarth. She portrayed the role of a photo journalist named Vidhya in the film. She first appeared in a Hindi television series, Choti Maa…Ek Anokha Bandhan in 2001. She has featured in a few television commercials. She charges between Rs 75 lakh to 1 crore per film as remuneration. Based on the data available on the internet, her net worth is estimated to be around $1 million dollars. This beautiful actress is the hearth-throb of millions of fans around the world. She also makes big from endorsement deals and has been the face of clothing shop, particularly known for silk-sarees, Pothys. Nithya Menen owns a couple of luxury houses, one in her hometown Bangalore and the other in Kochi, Kerala. All other details about her homes and the kind of cars she drive are very limited. Nithya Menen started acting at the tender age of 10. She has acted in all of the south Indian language films including Tamil, Telugu, Malayalam and Kannada. She would have been a great filmmaker if not an actress. Besides a versatile actress, she is a great singer who has sung over a dozen of songs in Tamil, Telugu, Malayalam and Kannada. Nithya is well versed in Malayalam, Tamil, Telugu, Kannada and English. Her debut Telugu film Ala Modhalaindi bagged three awards including a Nandi Award for Best Actress. She loves to wear diamond and platinum gold jewels. Nithya likes to do variety of roles in films rather identify herself a glam doll in the business. She is one of the few actresses in the industry who dubs herself for all her movies. She is an ardent devotee of Lord Krishna. Nithya Menen is a huge fan of nature and whenever she finds time for herself, she will go on hunting for pleasant places rather than investing time on social media. She is not a social media girl. Within a span of 10 years in entertainment industry, She has worked in more than 47 films and crooned more than 20 songs. 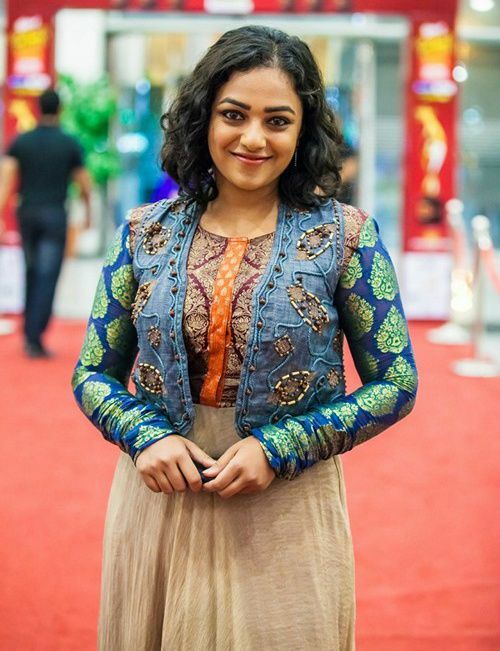 In 2018 Nithya Menen won the Best Supporting Actress – Tamil for her work in the movie Mersal (2017) at the 65th Filmfare Awards South.